A fluorescence collection is something very nice to have in any home. It is the ultimate WOW talking point. Whether you love looking at the pieces yourself or showing them to your friends you will find great enjoyment in having your own fluorescent mineral collection. Collectors are people who have a collection, not just those who go out into the field to collect. 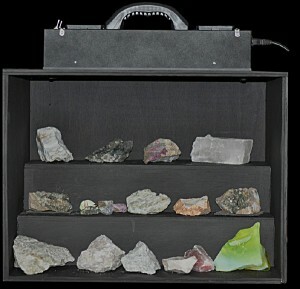 Many – perhaps most – collectors get their rocks from other people rather than searching for them out in the wild. You don’t have to be an adventurous 4WD type to build a beautiful collection. To get specimens from other countries, of course, you have to get them from other people. I started off resolved to collect just Australian pieces, but it took me no time at all to realise that fluorescent beauty is spread across the whole planet, and that I had to get hold of specimens from other countries as well as Aussie pieces. Many people start off by keeping their pieces in a box, and putting them out on a table to show them using a hand held UV lamp. That works fine, but a permanent display cabinet usually becomes an aim. Such a cabinet can be home made, or made by someone else. For a cabinet you need a display lamp rather than just a hand-held lamp, so if you go out collecting you need both. 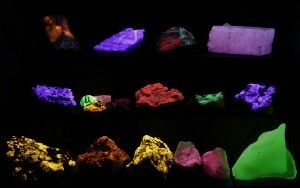 A small fluorescent mineral display. UVA (long wave) so no protective screen needed. First you can go out into the field and find them for yourself. That’s something you can add to things you do already if you love to get away and see interesting places. For me, looking for fluorescent rocks is a great excuse for going on extended camping trips. You soon realise, however, that your finest pieces are not necessarily going to be ones you have found yourself. For example, the only place in the world where you can find the spectacular Franklin willemite and calcite is Franklin New Jersey. If you want a Franklin specimen, and most collectors want at least one, you either go to NJ in USA, or buy one. So the second way to increase your collection is to buy pieces. You can do that without even going outside. Just google “fluorescent minerals” and you will find a vast number of specimens from all over the world on eBay and from individual fluorescent mineral sites. You will find pieces from just a couple of dollars, to very expensive large or rare ones. This is how most collections grow. You can also buy pieces by going to places where they are sold, not so easy in Australia, but easy in USA. In fact many of my overseas pieces were bought from friends in USA or at the famous Tucson Gem and Mineral Show in Arizona. The third way will get better as the number of collectors increases. When collectors get together we love to trade or swap pieces. That’s a good reason for Australian collectors to form some sort of group such as a chapter of the Fluorescent Mineral Society. If you would like to start collecting give me a call and I will try to help you get started. The main expense in starting out is the UV lamp(s). It is important to get the right lamp. Cheap long wave UV torches are no good at all. If that’s all you have you’ll soon be discouraged and give up. Since about 85% of the minerals that fluoresce do so under Short Wave (UVC), it’s best to get a Short Wave lamp to start off. There are basically three types of lamp, (i) hand-held 12V lamps for field use, (ii) larger 240V (or 120V) lamps for displays, and (iii) mid sized lamps that can be used both in the field and for a small display. I use UV Systems SuperBright lamps. These are expensive but are very robust if you are using them in rough areas. They are not made with multiple wavelengths, so if you want more than one of SW, MW and LW you need to buy more than one lamp. NOTE: Way Too Cool lamps are no longer made.